If you have ever seen a bunch of massacred peaches on the ground or discovered bites taken out of the fruit still on the tree, you know that squirrels are nearby. Not only do squirrels make a mess, but they ruin peaches that have not even had the chance to ripen. Fortunately, solutions to this problem do exist. By using a combination of tactics, keep squirrels out of your peach tree to ensure that you have a successful harvest. Trim the branches of your peach tree away from fences, garages or other areas that give squirrels access to your tree. Wrap sheet metal that is at least 2 feet wide and 4 to 6 feet away from the ground around the trunk of your tree. Squirrels cannot climb up this slippery material. Hang bags of human or dog hair from the limbs of your tree. These predator scents help deter squirrels. Additionally, hang mothballs near large groups of peaches because the squirrels detest this smell. Spray a squirrel repellent solution (available at garden centers and hardware stores) on your peach tree. Sprays typically contain fox urine, which scares squirrels away, and capsaicin--a chile pepper ingredient that squirrels do not like the taste of. 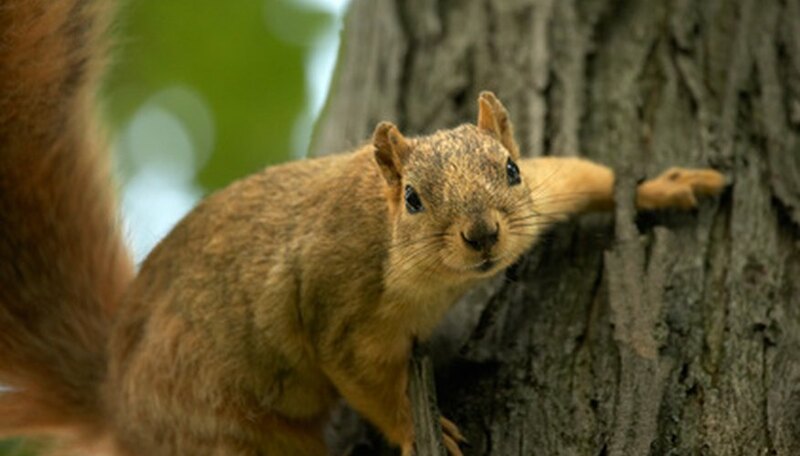 Consider getting a cat or dog to chase the squirrels away when they enter your property.